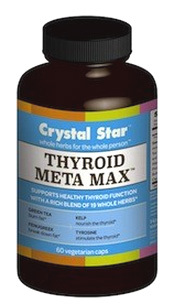 Thyroid Meta Max, 60 vegetarian capsules (Crystal Star) - Penn Herb Co. Ltd. This all-natural source of iodine supports thyroid balance and energy. It stimulates the thyroid to boost metabolism with a rich blend of 19 whole herbs. Supports metabolism with iodine-rich whole herbs: Green Tea to burn fat, Kelp, Fenugreek to break down fat, Kelp to nourish the thyroid, Tyrosine to stimulate the thyroid. AMOUNT PER SERVING (1 CAPSULE): Proprietary Herbal Blend 650 mg - Sea Veggie Blend (Bladderwrack, Kelp, Irish Moss), Green Tea Leaf, Fenugreek Seed, White Tea Leaf, Nettles Leaf, Dandelion Root, Parsley Root and Leaf, Coleus Forskholii, Saw Palmetto Berry, Watercress Herb, L-Tyrosine, Wild Yam Root, Prickly Ash Bark, Ginger Root, L-Glutamine, Butternut Bark, Spirulina, Grape Seed Extract, Capsicum annuum Pepper, Royal Jelly. OTHER INGREDIENTS: Vegetable-source Maltodextrin and Magnesium Stearate, Vegetarian Capsule (vegetable cellulose and water). Take 3 capsules daily, one before each meal for 2 months. Then 1 capsule daily as needed. NOTE: Before starting a self help program, consult your healthcare professional.